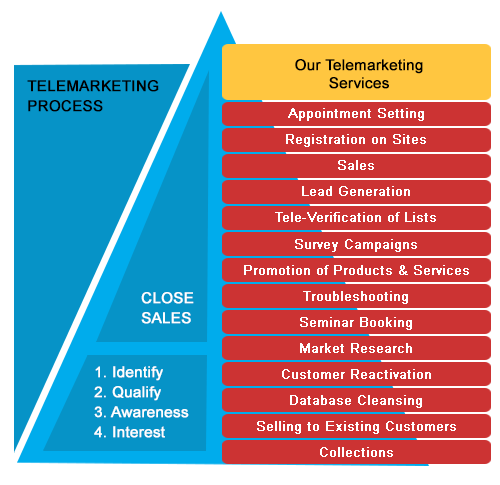 Telemarketing is a powerful demand generation tactic and a cost-effective way to generate qualified leads. If utilized strategically, telemarketing can provide high lead generation ROI. In a serious environment of the B2B market, the impact of human conversation and connection can provide highly positive results. After all, companies and brands are owned and managed by people. B2B telemarketing is more than just talking, convincing and selling to prospects. It is more importantly about listening, understanding, discovering and providing relevant information to take customer relationships and prospect interactions to the next level. Telemarketing is no longer about the number of calls it is about how many calls translate to improvement in customer relationship, value, sales and business growth. It is easier to find and contact the right person.. It is a channel that allows you to easily interact with prospects, with an opportunity to answer their queries and concerns about your product or service. It helps in increasing efficiency as you can reach many more prospects by phone than with in-person sales calls. It helps in improving relationships and maintaining contact with existing customers, as well as introducing new products to them. The results are highly measurable. It serves as an information source about your prospects, provided you ask the right questions. It is cost effective if outsourced, as there are minimal expenses involved. It costs less when compared to direct sales. It makes it easy to expand sales territory as you can easily connect with local, national and global prospects.